Honeymoon is a very special time in every couple's life and what makes it even more unique is the destination where you spend it! So, make your honeymoon time a memorable lifetime experience by taking this exclusive holiday package with us. With this 5 nights and 6 days tour you will get to enjoy a romantic Shikara ride in Dal Lake, try some skiing in the snow capped mountain slopes in Gulmarg and romantic abode in the famous houseboats. Book this tour now and be ready to start your married life amidst the bliss of nature! It is 2 star hotel of the renowned Zahgeer Group of Hotels, located amidst the beautiful valley. The hotel has 28 well-furnished guest rooms stuffed with all modern facilities and services. The multi-cuisine restaurant offers appetizing delicacies. This hotel is a prime 3 star hotel located at a distance of just 100 KM from the Srinagar Airport, set in the picturesque backdrop of Pahalgam. It has 29 rooms each stuffed with modern amenities and facilities. Its multi-cuisine restaurant serves a range of delicious delicacies. Idyllically located on the tranquil banks of the Dal Lake, this young houseboat is just 15 KM away from the Srinagar Airport and 4 KM from Mughal gardens. It has a total of 3 traditionally designed rooms to offer a memorable stay to its guests. 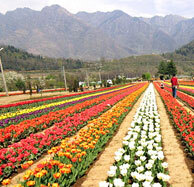 On arrival at the Srinagar airport (on your own), meet our representative who will transfer you directly to Gulmarg. Check-in at the pre-booked hotel and relax for the rest of the day. Rise early in the morning amidst the blissful surroundings of Gulmarg. Enjoy breakfast and proceed for full day sightseeing tour of Gulmarg. Here, you can either enjoy pony rides and Gondola rides (on direct payment basis) or spend some quite with the nature. Return to the hotel for overnight stay. Post breakfast leave for the next destination, the most popular holiday resort in Kashmir, Pahalgam. On arrival, check-in at the hotel and spent the rest of the day at leisure while exploring the scenic surroundings of Pahalgam. After taking breakfast, you will be taken for a full day sightseeing trip of Pahalgam. Here, you can try angling on the river Lidder, horse riding, trekking and many other fun activities. You will also get to visit the famous Betaab valley. Return to the hotel for overnight stay. Have breakfast and proceed for Srinagar. After reaching Srinagar, check-in to the pre-booked houseboat. Spend the rest of the day at leisure with romancing nature and valley around the Dal Lake. A romantic Shikara ride will also be provided. Overnight stay will be at the comfort of houseboat. Enjoy leisurely breakfast and get transferred to the Srinagar Airport to board flight for your onward destination.